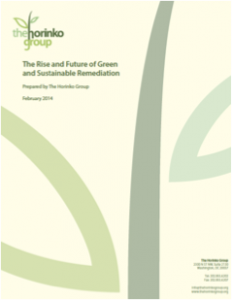 The Horinko Group’s latest white paper focuses on green and sustainable remediation, an effort underway within the remediation industry to make contaminated site cleanups more environmentally, economically, and socially beneficial. The report details the development of this concept as well as the many ongoing efforts, successes, and challenges to advance remediation practices in the United States and internationally. The white paper is intended to serve as a tool and resource guide to stakeholders involved in all facets of site remediation from engineers to consultants to policy makers. It also aims to consolidate and summarize the many simultaneous efforts to improve the sustainability of site cleanups and complement these efforts to create a greater and more widespread understanding of green and sustainable remediation. To read the full report, visit http://bit.ly/1nncwEs.